This article is about Eulerian circles of set theory and logic. For the geometric Euler circle, see Nine-point circle. An Euler diagram (/ˈɔɪlər/, OY-lər) is a diagrammatic means of representing sets and their relationships. Typically they involve overlapping shapes, and may be scaled, such that the area of the shape is proportional to the number of elements it contains. They are particularly useful for explaining complex hierarchies and overlapping definitions. They are often confused with Venn diagrams. Unlike Venn diagrams, which show all possible relations between different sets, the Euler diagram shows only relevant relationships. The first use of “Eulerian circles” is commonly attributed to Swiss mathematician Leonhard Euler (1707–1783). In the United States, both Venn and Euler diagrams were incorporated as part of instruction in set theory as part of the new math movement of the 1960s. Since then, they have also been adopted by other curriculum fields such as reading as well as organizations and businesses. Euler diagrams consist of simple closed shapes in a two dimensional plane that each depict a set or category. How or if these shapes overlap demonstrates the relationships between the sets. There are only 3 possible relationships between any 2 sets; completely inclusive, partially inclusive, and exclusive. This is also referred to as containment, overlap or neither or, especially in mathematics, it may be referred to as subset, intersection and disjoint. In a logical setting, one can use model theoretic semantics to interpret Euler diagrams, within a universe of discourse. 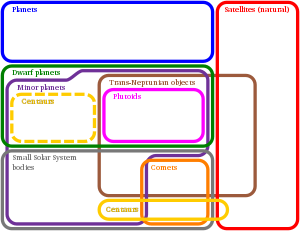 In the examples below, the Euler diagram depicts that the sets Animal and Mineral are disjoint since the corresponding curves are disjoint, and also that the set Four Legs is a subset of the set of Animals. The Venn diagram, which uses the same categories of Animal, Mineral, and Four Legs, does not encapsulate these relationships. Traditionally the emptiness of a set in Venn diagrams is depicted by shading in the region. Euler diagrams represent emptiness either by shading or by the absence of a region. Often a set of well-formedness conditions are imposed; these are topological or geometric constraints imposed on the structure of the diagram. For example, connectedness of zones might be enforced, or concurrency of curves or multiple points might be banned, as might tangential intersection of curves. In the adjacent diagram, examples of small Venn diagrams are transformed into Euler diagrams by sequences of transformations; some of the intermediate diagrams have concurrency of curves. However, this sort of transformation of a Venn diagram with shading into an Euler diagram without shading is not always possible. There are examples of Euler diagrams with 9 sets that are not drawable using simple closed curves without the creation of unwanted zones since they would have to have non-planar dual graphs. Photo of page from Hamilton’s Lectures on Logic. The symbolism A, E, I, and O refer to the categorical statements that can occur in a syllogism. The small text to the left erroneously states: “The first employment of circular diagrams in logic improperly ascribed to Euler. To be found in Christian Weise”, a book actually written by Johann Christian Lange. On the right is a photo of page 74 from Couturat 1914 wherein he labels the 8 regions of the Venn diagram. The modern name for these “regions” is minterms. These are shown on the left with the variables x, y and z per Venn’s drawing. The symbolism is as follows: logical AND ( & ) is represented by arithmetic multiplication, and the logical NOT ( ~ )is represented by ” ‘ ” after the variable, e.g. the region x’y’z is read as “NOT x AND NOT y AND z” i.e. ~x & ~y & z. Both the Veitch diagram and Karnaugh map show all the minterms, but the Veitch is not particularly useful for reduction of formulas. Observe the strong resemblance between the Venn and Karnaugh diagrams; the colors and the variables x, y, and z are per Venn’s example. A: The Universal Affirmative, Example: “All metals are elements”. E: The Universal Negative, Example: “No metals are compound substances”. I: The Particular Affirmative, Example: “Some metals are brittle”. O: The Particular Negative, Example: “Some metals are not brittle”. Composite of two pages 115–116 from Venn 1881 showing his example of how to convert a syllogism of three parts into his type of diagram. Venn calls the circles “Eulerian circles” (cf Sandifer 2003, Venn 1881:114 etc) in the “Eulerian scheme” (Venn 1881:100) of “old-fashioned Eulerian diagrams” (Venn 1881:113). (Sandifer 2003 reports that Euler makes such observations too; Euler reports that his figure 45 (a simple intersection of two circles) has 4 different interpretations). Whatever the case, armed with these observations and criticisms, Venn then demonstrates (pp. 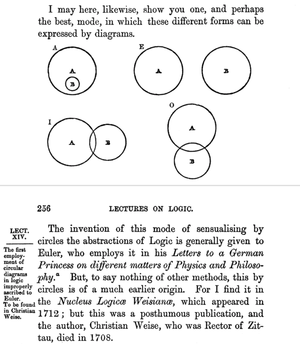 100–125) how he derived what has become known as his Venn diagrams from the “…old-fashioned Euler diagrams.” In particular he gives an example, shown on the left. “No Y is Z and ALL X is Y: therefore No X is Z” has the equation x’yz’ + xyz’ + x’y’z for the unshaded area inside the circles (but note that this is not entirely correct; see the next paragraph). “No Y is Z and ALL X is Y: therefore No X is Z” has the equation x’yz’ + xyz’ + x’y’z + x’y’z’ . In modern usage the Venn diagram includes a “box” that surrounds all the circles; this is called the universe of discourse or the domain of discourse. The history of Karnaugh’s development of his “chart” or “map” method is obscure. Karnaugh in his 1953 referenced Veitch 1951, Veitch referenced Claude E. Shannon 1938 (essentially Shannon’s Master’s thesis at M.I.T. ), and Shannon in turn referenced, among other authors of logic texts, Couturat 1914. In Veitch’s method the variables are arranged in a rectangle or square; as described in Karnaugh map, Karnaugh in his method changed the order of the variables to correspond to what has become known as (the vertices of) a hypercube. This example shows the Euler and Venn diagrams and Karnaugh map deriving and verifying the deduction “No Xs are Zs”. Before it can be presented in a Venn diagram or Karnaugh Map, the Euler diagram’s syllogism “No Y is Z, All X is Y” must first be reworded into the more formal language of the propositional calculus: ” ‘It is not the case that: Y AND Z’ AND ‘If an X then a Y’ “. Once the propositions are reduced to symbols and a propositional formula ( ~(y & z) & (x → y) ), one can construct the formula’s truth table; from this table the Venn and/or the Karnaugh map are readily produced. By use of the adjacency of “1”s in the Karnaugh map (indicated by the grey ovals around terms 0 and 1 and around terms 2 and 6) one can “reduce” the example’s Boolean equation i.e. (x’y’z’ + x’y’z) + (x’yz’ + xyz’) to just two terms: x’y’ + yz’. But the means for deducing the notion that “No X is Z”, and just how the reduction relates to this deduction, is not forthcoming from this example. Given a proposed conclusion such as “No X is a Z“, one can test whether or not it is a correct deduction by use of a truth table. The easiest method is put the starting formula on the left (abbreviate it as P) and put the (possible) deduction on the right (abbreviate it as Q) and connect the two with logical implication i.e. P → Q, read as IF P THEN Q. If the evaluation of the truth table produces all 1s under the implication-sign (→, the so-called major connective) then P → Q is a tautology. Given this fact, one can “detach” the formula on the right (abbreviated as Q) in the manner described below the truth table. The Truth Table demonstrates that the formula ( ~(y & z) & (x → y) ) → ( ~ (x & z) ) is a tautology as shown by all 1s in yellow column. One is now free to “detach” the conclusion “No Xs are Zs”, perhaps to use it in a subsequent deduction (or as a topic of conversation). The use of tautological implication means that other possible deductions exist besides “No Xs are Zs”; the criterion for a successful deduction is that the 1s under the sub-major connective on the right include all the 1s under the sub-major connective on the left (the major connective being the implication that results in the tautology). For example, in the truth table, on the right side of the implication (→, the major connective symbol) the bold-face column under the sub-major connective symbol ” ~ ” has the all the same 1s that appear in the bold-faced column under the left-side sub-major connective & (rows 0, 1, 2 and 6), plus two more (rows 3 and 4). A Venn diagram shows all possible intersections. Humorous diagram comparing Euler and Venn diagrams. Euler diagram of types of triangles, using the definition that isosceles triangles have at least (rather than exactly) 2 equal sides. Euler diagram of terminology of the British Isles. Some of the Euler diagrams are not typical, and some are even equivalent to Venn diagrams. Areas are shaded to indicate that they contain no elements. Spider diagram – an extension of Euler diagrams adding existence to contour intersections. ^ By the time these lectures of Hamilton were published, Hamilton too had died. His editors (symbolized by ED. ), responsible for most of the footnoting, were the logicians Henry Longueville Mansel and John Veitch. ^ See footnote at George Stibitz. ^ This is a sophisticated concept. Russell and Whitehead (2nd edition 1927) in their Principia Mathematica describe it this way: “The trust in inference is the belief that if the two former assertions [the premises P, P→Q ] are not in error, the final assertion is not in error . . . An inference is the dropping of a true premiss [sic]; it is the dissolution of an implication” (p. 9). Further discussion of this appears in “Primitive Ideas and Propositions” as the first of their “primitive propositions” (axioms): *1.1 Anything implied by a true elementary proposition is true” (p. 94). In a footnote the authors refer the reader back to Russell’s 1903 Principles of Mathematics §38. ^ Reichenbach discusses the fact that the implication P → Q need not be a tautology (a so-called “tautological implication”). Even “simple” implication (connective or adjunctive) will work, but only for those rows of the truth table that evaluate as true, cf Reichenbach 1947:64–66. ^ a b Venn, John (1881). Symbolic Logic. London: MacMillan and Co. p. 509. ^ Hamilton 1860:179. The examples are from Jevons 1881:71ff. Sir William Hamilton 1860 Lectures on Metaphysics and Logic edited by Henry Longueville Mansel and John Veitch, William Blackwood and Sons, Edinburgh and London. W. Stanley Jevons 1880 Elementary Lessons in Logic: Deductive and Inductive. With Copious Questions and Examples, and a Vocabulary of Logical Terms, M. A. MacMillan and Co., London and New York. Alfred North Whitehead and Bertrand Russell 1913 1st edition, 1927 2nd edition Principia Mathematica to *56 Cambridge At The University Press (1962 edition), UK, no ISBN. Louis Couturat 1914 The Algebra of Logic: Authorized English Translation by Lydia Gillingham Robinson with a Preface by Philip E. B. Jourdain, The Open Court Publishing Company, Chicago and London. Claude E. Shannon 1938 “A Symbolic Analysis of Relay and Switching Circuits”, Transactions American Institute of Electrical Engineers vol 57, pp. 471–495. Derived from Claude Elwood Shannon: Collected Papers edited by N.J.A. Solane and Aaron D. Wyner, IEEE Press, New York. Hans Reichenbach 1947 Elements of Symbolic Logic republished 1980 by Dover Publications, Inc., NY, ISBN 0-486-24004-5. Edward W. Veitch 1952 “A Chart Method for Simplifying Truth Functions”, Transactions of the 1952 ACM Annual Meeting, ACM Annual Conference/Annual Meeting “Pittsburgh”, ACM, NY, pp. 127–133. Maurice Karnaugh November 1953 The Map Method for Synthesis of Combinational Logic Circuits, AIEE Committee on Technical Operations for presentation at the AIEE summer General Meeting, Atlantic City, N. J., June 15–19, 1953, pp. 593–599. Frederich J. Hill and Gerald R. Peterson 1968, 1974 Introduction to Switching Theory and Logical Design, John Wiley & Sons, NY, ISBN 978-0-471-39882-0. Ed Sandifer (January 2004). “How Euler Did It” (PDF). maa.org. Archived from the original (PDF) on 2013-01-26. Euler Diagrams. Brighton, UK (2004).What are Euler Diagrams?